Rajasthan is India's largest state by area. 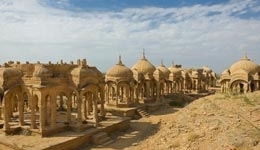 It is located on the north western side of the India, where it comprises most of the wide and inhospitable Thar Desert. It is bordered by five other Indian states: Punjab to the north; Haryana and Uttar Pradesh to the northeast; Madhya Pradesh to the southeast; and Gujarat to the southwest. Best known for its proximity to the Sariska Tiger Reserve, Alwar, like most Rajasthani towns also offers an insight into the state’s rich history and culture. 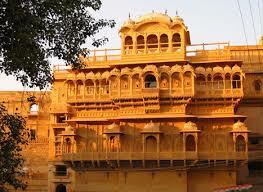 Barmer, in the western Rajasthan, is a desert town located 153 km from Jaisalmer. It forms a major part of the Thar Desert. The town many has historical sites and is a popular tourist destination. Though a barren land with harsh climate and tough terrain, Barmer is known for its rich crafts, dance and music. Barmer gets its name from its ruler Bahada Rao Parmar (Panwar) or Bar Rao Parmar who is said to have founded the town in the 13th century. Earlier it was called Bahadamer, meaning The Hill Fort of Bahada. In 2009, India’s first onshore oil field was discovered in Barmer. The magnificent forts and palaces bear testimony to Bikaner’s architectural legacy and the winding lanes and colorful bazaars make Bikaner an interesting destination to explore. Famous for its architecture, paintings and festivals, Bundi is a small city in the Hadoti region of Rajasthan. Situated 36 km from Kota, the city is set in narrow encircling gorge and appears like a miniature painting. Termed as ‘Queen of Hadoti’, the city gets its name from king Bundi Meena of the Meena tribe, a prominent local tribe. The city was named as ‘Bundi ka nal’; the word ‘nal’ means narrow ways. 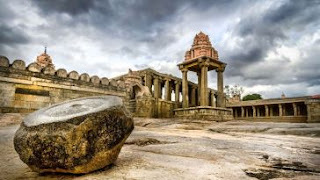 Later in 1342 AD, Rao Deva Hara took over the region from Jaita Meena and renamed the city as Bundi. Bundi was conquered by Hada Rajputs in 1241 and ruled for 200 years. Hada Rajputs lost control over Bundi, when Rao Surjan surrendered to Akbar in 1533. In 19thcentury, Bundi came under the reign of British rule. Today tourists can visit historical forts, palaces, stepwells in Bundi. The most prominent attraction of the city is Taragarh fort. Built in 1354, the fort is known for its huge canon, the Garbh Gujam. 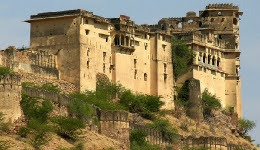 Other attractions of the city are Bundi palace, Chaurasi Khambhon-ki-Chatri, Sukh mahal and many more. The Chittorgarh fort was built by the Mauryans in 7th century. The fort is one of the strongest forts in India and its main attractions are the two commemoration towers, Kirti Stambh and Vijay Stambh. The former was built to honor the first Jain Tirthankar and the latter was built to commemorate the victory over Mohammed Khilji. Chittorgarh is also a great place for shopaholics. Visitors can buy metal works, fabrics, handmade toys, leather shoes and jewelry. Another attraction of the city is the biggest Rajput festival called Jauhar Mela held to honor the sacrifice and bravery of the ancestors and all three jauhars which happened in Chittorgarh fort. 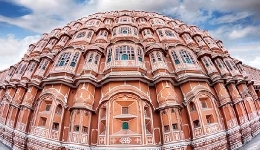 Pink City, Jaipur is home beautiful palaces, markets and forts. And its annual Jaipur Literature Festival is just one more pleasant addition to the city’s rich culture. 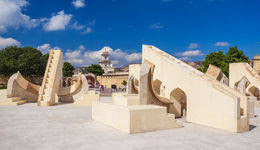 A visit to Jaipur is incomplete without a visit to the historic Jantar Mantar. It is one of the five observatories built by Sawai Jai Singh in 1718. It houses a huge collection of astronomical instruments and the world’s biggest sundial. Jantar Mantar is a UNESCO World Heritage site and is a must-visit for all history lovers. Jaswant Thada is popularly known as the ‘Taj Mahal of Marwar’. The royal monument is a cenotaph dedicated to Maharaja Jaswant Singh II, the 33rd ruler of Jodhpur. Located in the vicinity of Mehrangarh Fort, Jaswant Thada was built by Maharaja Sardar Singh, for his father in 1899. The structure is an epitome of a Rajputana style of architecture. Built from intricately carved marble sheets, the polished stone exudes a warm glow when sunrays fall on it. The structure also has some beautiful carved marble lattice work. 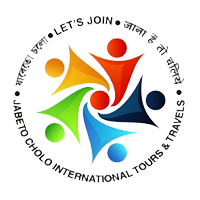 Kota in Rajasthan is an industrial hub and thriving educational center. Located on the banks of Chambal river, Kota was part of Bundi till it became an independent kingdom. The City Fort Palace Kota’s most popular attraction and the complex is one of the largest in Rajasthan. Kota is also known for its Dussehra celebrations. The festival is celebrated in a unique way, with episodes from Ramayana being enacted on stage. The main attraction of the fair is, of course, the burning of the effigies of Ravana, Kumbhakaran and Meghnath. Abandoned in favor of Mehrangarh Fort, Mandore bears a silent testimony to a bygone era. 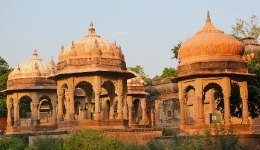 From cenotaphs to landscaped gardens, Mandore is where history comes alive. 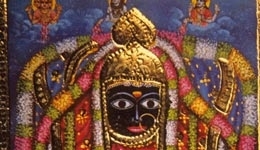 Nathdwara is a small town located in Rajasthan and is a prominent centre of Krishna worship. Literally speaking, the term Nathdwara means the doorway to the lord. 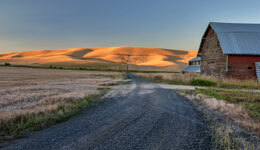 The town is a picturesque spot that unveils the magnificence of imposing hills. The architectural grandeur of the temples here surpasses any of the modern constructions. Located some 90-odd km to the south of Jaipur on route to the Ranthambore National Park, Tonk is not exactly on a regular tourist trail in Rajasthan but certainly deserves a visit. Once ruled by Afghani pathans, the small town has a smattering of mansions that are a fine testament to the wealth and the power of its owners who ruled the town. Jostling for attention alongside these ancient mansions are colonial buildings that came about during the Raj when Tonk served as an important administrative center for the British. The two most exquisite buildings in Tonk are the Sunehri Kothi and the Jama Masjid.